Empowering your mobile workforce has become a primary concern for almost every business today. From the warehouse and delivery destinations to the retail sales floor and patient bedside, having access to critical information on a mobile device that is easy to use and can handle the rigors of daily use is key to a capable, efficient workforce. Many businesses are looking to the familiar Apple devices (iPhone, iPad, iPod) as viable solutions due to their familiar interface that their employees are often already familiar with. Utilizing these devices mean less time training and easier integration into the company’s workflow. The biggest hurdle with the Apple products in enterprise applications is the lack of durability and capable barcode scanner or magnetic stripe reader. This is where Honeywell’s Captuvo line can take your Apple device from a standard consumer device to an enterprise-grade mobile computer. As businesses find more and better ways to maintain efficiency and streamline operations, the use of iPhones and iPads for a variety of applications is becoming more appealing. One of the main draw backs of these consumer devices is their lack of durability and barcode scanners or card readers. Honeywell is leading the way with several enterprise sleds that work with Apple devices that act as a protective housing and have dedicated scanners/msr readers. This infographic is a great overview of the Captuvo line of sleds to help you see how you can better improve your technology investments. After the initial announcement in January of this year, the Honewyell Captuvo SL62 is currently available for purchase and delivery. The Captuvo SL62 enterprise sled encases the popular Apple iPad mini, transforming it into an enterprise-ready device for businesses that prefer the simplicity and familiarity of iOS, but need additional functionality built-in for instant access to inventory, scanning and secure payment processing. The Captuvo SL62 is fully compatible with all Apple iPad mini models. For assistance choosing the right version for your business needs, contact us at BarcodesInc. 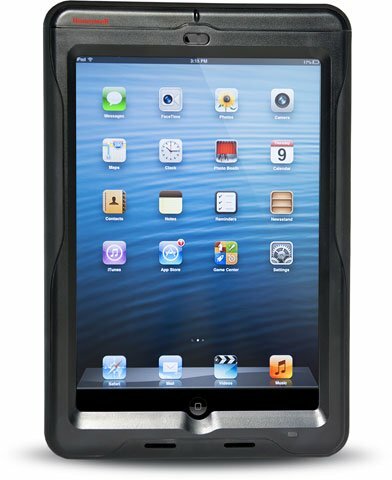 Honeywell announced the debut of their new Captuvo SL62 enterprise sled, an encasement that transforms an Apple iPad mini into a customer engagement tool for retail, hospitalityand field service associates, at the NRF 2014 Expo. Building off Honeywell’s successful Captuvo line, which includes the SL22 and SL42 encasements for fifth generation iPod touch and iPhone 5 devices, the SL62 helps employees look up inventory, scan barcodes and securely process payments, increasing customer engagement and improving mobile point-of-sale. It gives associates access to transaction data via the Web or mobile apps, providing an opportunity to upsell products and services and keep customers more engaged in the buying process.